I finally got my hands on an XD-S 9mm, courtesy of a friend that recently purchased one. I do own a bi-tone XD-S .45, and you can click on the ‘Product Reviews’ tab, then scroll down for the three-part review of that pistol. I had some 9mm ammo left over from when I owned a Glock 17, so I supplied the ammo for the practice session, which included some 124gr FMJ’s from Good To Go Ammo, Winchester Nato 124gr FMJ, Corbon DPX 115gr +p, and Hornady Critical Duty 135gr +p. I have not shot my XD-S in a couple months and have been shooting nothing but .45 (FNX 45 Tactical), 10mm (gen-4 Glock 20) and .44 mag (Ruger SRH) as of late. I like a bigger grip, so I wrap my revolver grips in tennis grip tape, both for a familiar feel and to bulk up the grip. I have a Pachymayr grip sleeve on my XD-S .45 and find the grip barely acceptable, even with the largest backstrap. I also only shoot the XD-S .45 with the extended magazine. 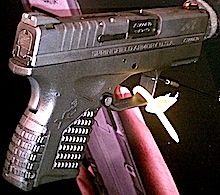 So, I was immediately reminded how thin the pistol is upon inserting a flush mag into the XDS-9mm. The first few shots were cumbersome, because of the somewhat squishy uptake in the trigger, but the rhythm came back to me after about ten shots. I also found the lack of full support for the pinky finger tough to get used to coming from the FNX 45 Tactical. Like the XDS-45, felt recoil from the 9mm version was less than expected. I actually had to load up Winchester Nato and Hornady Critial Duty just to feel like I was shooting something 🙂 The XDS-9 ate everything I fed it for over 200 rounds. In terms of ammo performance, I’m also going to guess that the 9mm is similar to the .45 in that loads like the Hornady Critical Defense or short-barrel Speer Gold Dot probably yield the best performance for the dollar. The Corbon DPX felt really good to shoot. Hornady Critical Duty is better suited for longer barrels. I can’t really comment on accuracy because it just felt too strange firing the XDS-9 without the extended mag. I suspect that if you practice regularly with the flush mag, it won’t be an issue. Although I’m an XD-S fan, I did find the 9mm Shield easier to shoot accurately more quickly way back in the day when I rented one at Eagle Gun Range. On that topic, I’ll leave you with a video of Hickock45 comparing the Shield and XDS-9. Hopefully, this will give you another perspective. The XDS-9 is currently available only in all black, but the bi-tone model is coming quickly. $599 seems to be the going price at the local gun shows. I probably won’t buy one since I’m very satisfied with my current pistol collection and .45/10mm as baseline calibers. 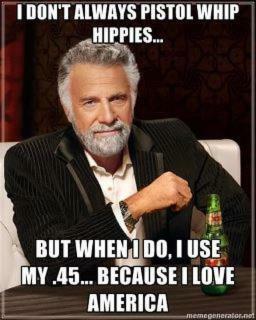 After all, I am an American and it is July 4 in a couple days, so my thoughts about the .45 are best summarized below.